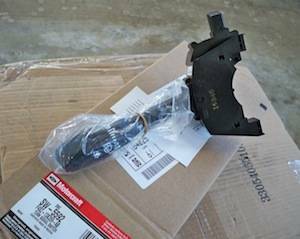 When I bought my 1996 Thunderbird LX, I discovered that the hazard lights did not work. And after I tried to turn the hazard lights on, the turn signals didn't work at all. Only after restarting the car would they work again. Plus, I also had problems with the right turn signal blinking fast if I held the lever but didn't click it all the way to signal a right turn. Based on the symptoms and other complaints I found on the 'net, I decided to replace the multi-function switch on my T-Bird. I scored a new MFS from the dealer for $60 so I figured that since I plan on keeping my car a long time, I may as well just get a new one from Ford. You know Ford will always have the best quality parts. The part number you need is SW-5592. Other part numbers may also cross-reference to that one, so be sure to check an application guide to be sure you're getting the right part. Electrical parts are usually not returnable once purchased, so be sure! Now, before you rush out and buy a new switch, it's a good idea to do a little troubleshooting to be sure you need a new switch. Check your flasher relay and all your exterior bulbs if you're having problems with your turn signals. Check fuses, etc. Tilt column to lowest position and remove tilt steering column lock lever. 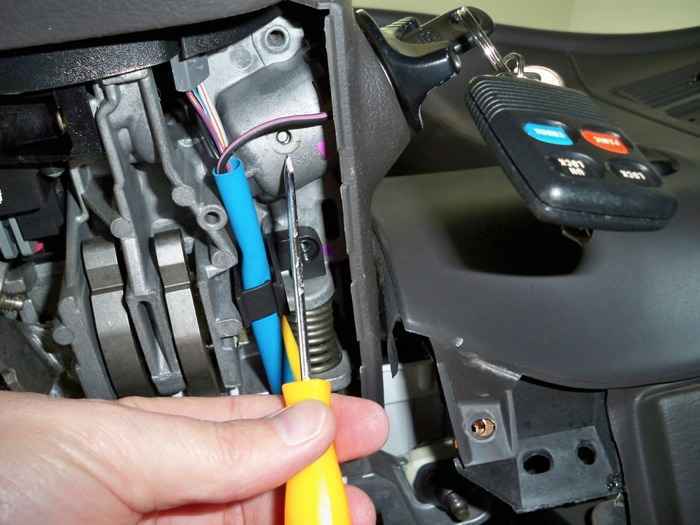 Remove ignition switch lock cylinder. Remove shroud screws and remove upper steering column shroud and lower steering column shroud. 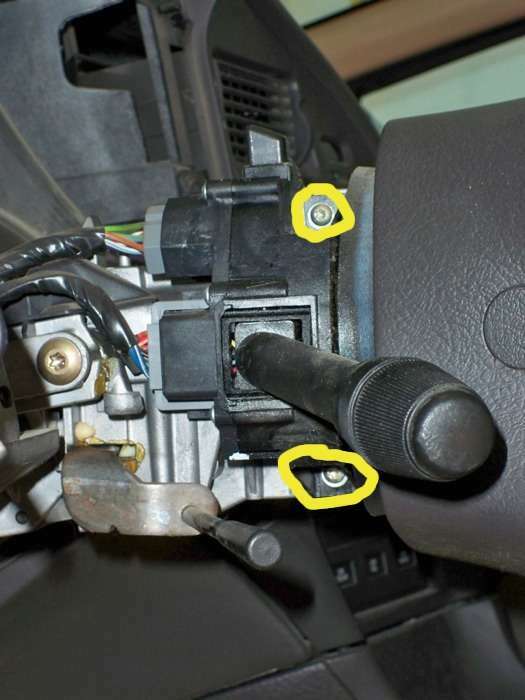 Remove two self-tapping screws retaining multi-function switch to steering column casting. Disengage multi-function switch from casting. Align mounting holes in multi-function switch with corresponding holes in steering column casting. Install two self-tapping screws, making sure to start screws in the previously tapped holes. Tighten to 2-3 Nm (18-26 lb-in). 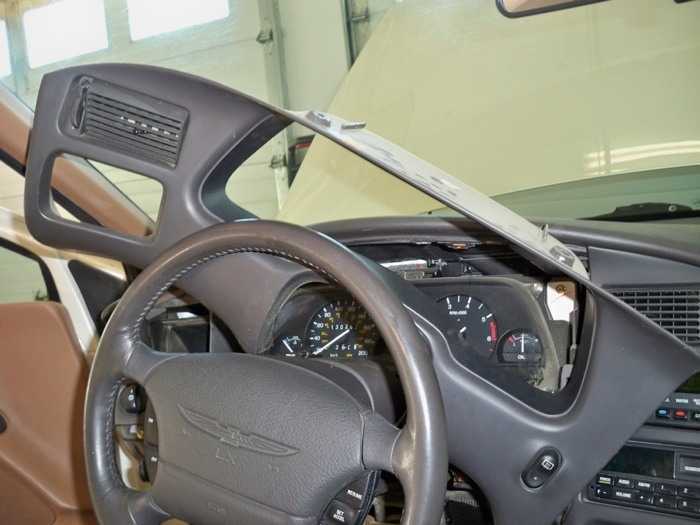 Install upper steering column shroud and lower steering column shroud. Install ignition switch lock cylinder. Install tilt steering column lock lever. 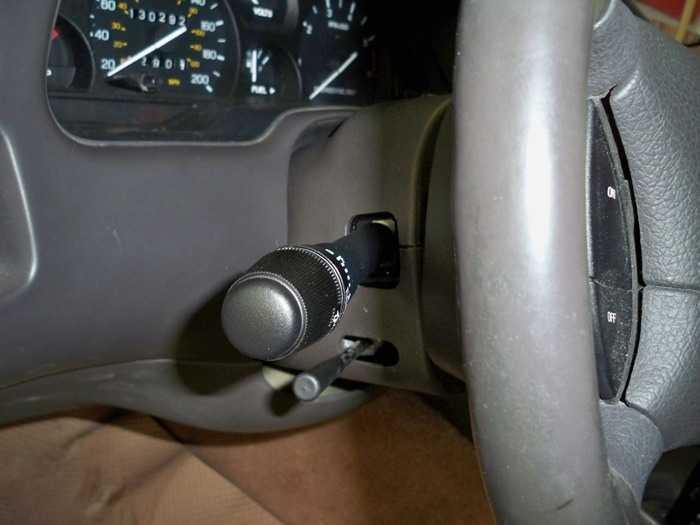 Check steering column and multi-function switch for proper operation. Step 1: Disconnect the negative battery lead. Easy stuff, grab an 8mm wrench or socket and remove that bad boy. Make sure the battery doesn't get reconnected while you're doing the job. 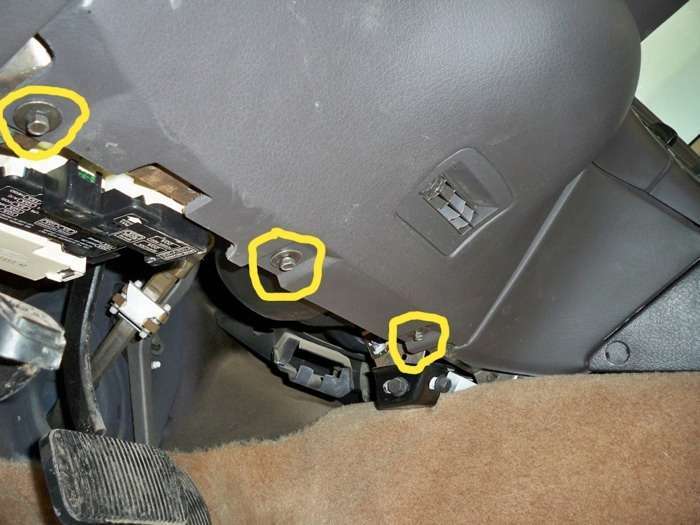 Once you have those bolts out, remove that panel by pulling it straight back toward the seat. There are three clips that are at the top, they just "snap" out and back in. 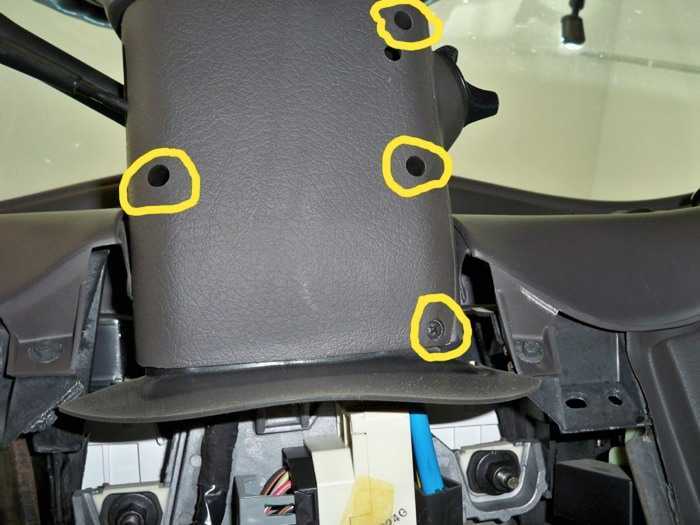 Step 4: Remove the 4 screws you can see on the bottom steering column shroud, outlined in yellow here. Once they're out, remove the lower shroud and set aside. That other hole in the shroud is used to remove the ignition cylinder, which we'll do next. 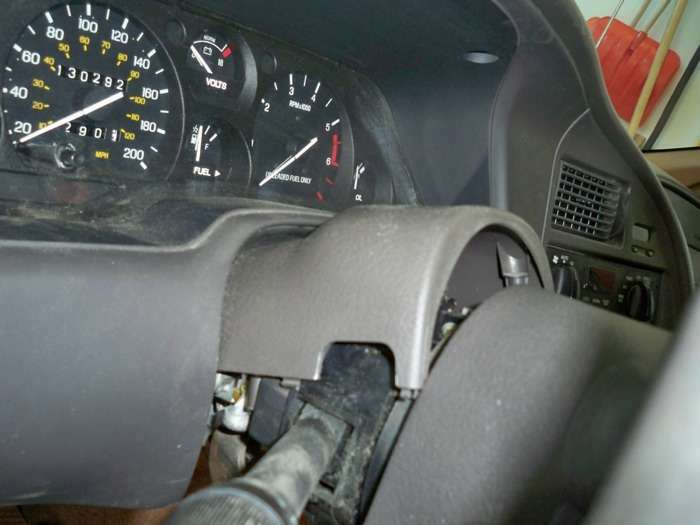 Step 5: Remove the ignition cylinder switch. It's easy, just use a small pointy tool like an awl or small screwdriver. Turn the key to the "ON" position, depress the circular "pin" shown just above my tool here... once you've pressed that in, the whole key & cylinder assembly will slide out as one unit. Set it aside, be careful not to drop or disassemble it. Step 6: Remove the upper steering column shroud. It's not held on by anything else. It's supposed to just slip off, but I couldn't get mine off. In my case I removed the instrument panel surround to help get the upper steering column shroud off. I'm not sure if you'll have to do that too, I guess it depends on what year your T-Bird/Cougar is. Mine's a 1996. If you wind up removing this stuff like me, there are two 7mm screws above the gauges and three at the bottom of the panel (hidden under the first cover you took off in step 2). Then it pulls straight back to snap out of place. It's a tight fit, it took some wiggling to get this thing out, be careful not to crack or break it!! Step 7: Remove the two torx screws on the old multifunction switch (MFS). One screw is at the top, one at the bottom, I've outlined them in yellow. It should basically fall out. 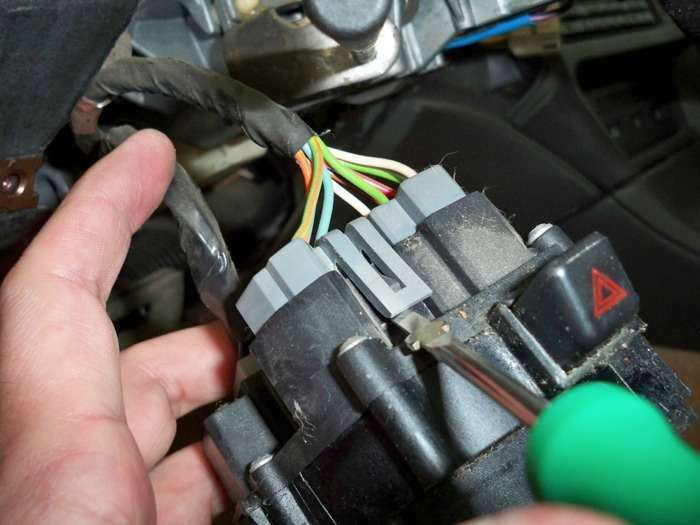 Step 8: Next up, disconnect the electrical connectors. There are two "tabs" on each connector (one on either side), you'll need to pry the tabs up slightly to get the wiring connectors off. 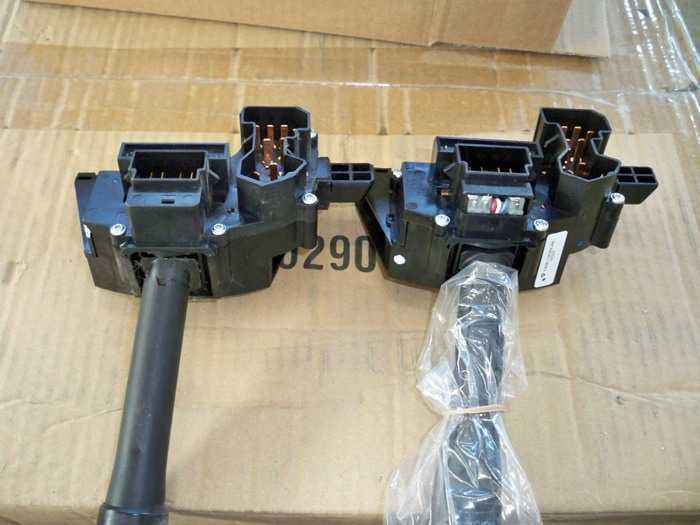 Remove both connectors. Step 9: Compare the old and new MFS to make sure it's the right one. 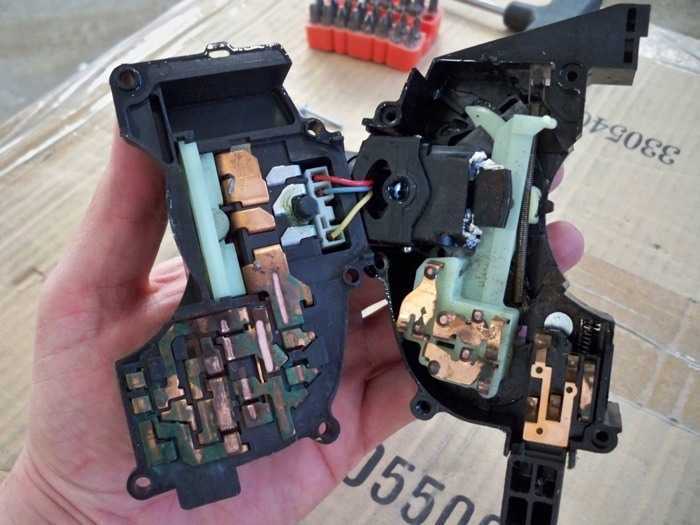 Be sure the wiring connections are right, etc. Step 10: Install the new one using the reverse of the above steps. Test the new switch, all functions - wiper, hazard lights, turn signals, etc. Just for giggles, I took the old switch apart to see why the hazard lights didn't work. As you can see there is a TON of corrosion on almost everything. Honestly I probably could have taken the old switch apart and tried to clean off the corrosion and make it work again. But the wipers, turn signals, and hazard lights are all safety isssues for me, they get a lot of use and they need to work when I use them. So I don't mind spending the $60 or so for a new switch!